We now have gallon glass jars containing 12 Lbs of honey available in our TOTALLY RAW HONEY as well as our Golden Nectar Honey, Black & Gold Honey, Fall Wildflower Honey, and Buckwheat Honey. We have 60 Lb Pails available in our Golden Nectar Honey, Black & Gold Honey, and Fall Wildflower Honey. 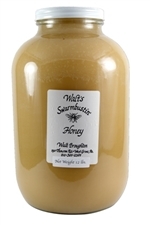 We are not able to offer our Totally Raw Honey or Buckwheat Honey in Pails. Pure Spring Honey. Pale and delicate in flavor with a full body and nice finish. This honey is derived from the spring flush of the Tulip Poplar tree, Black Locust, fruit bloom and Clover Blossoms. Ideal for sweetening tea. One gallon is 12 pounds or 192 ounces. Amber Honey. The fall season offers to the bees a medley of floral sources including Asters, Goldenrod and Japanese Knotweed; from which this dark, rich and smoky honey is gathered. Particularly good on pancakes. One gallon is 12 pounds or 192 ounces. Dark amber Honey. This distinctive honey, with its robust and hearty flavor, comes from stands of pure buckwheat grain, a rarity in itself. A nice topping on sweet potatoes, winter squash or whisked into a stir-fry; also a garnish to your favorite dessert. One gallon is the same as 12 pounds is the same as 192 ounces. Full season light amber honey blend. Our own blend of spring honey with a splash of fall wildflower, this honey has nectar the bees have gathered from throughout the year. Well suited for baking. Five gallons is 60 pounds.